Saturday, April 18, 2015- 1:00 PM (EST). This event is an Internet only sale. Preview may be arranged by appointment. Absentee bids are welcome. PLYMOUTH, Mass. - March 27, 2015 - PRLog -- J. James Auctioneers & Appraisers is pleased to offer an important private collection of ninety historically significant Russian propaganda posters and publications spanning from the Tsarist Empire through World War II, to be sold at auction on April 18, 2015. Select items from this collection were on loan to the Phoenix Museum of Art for their exhibit titled, "The Revolution in Print: Russian Political Posters from the Elinor Fagan Collection", held April -July 2000. 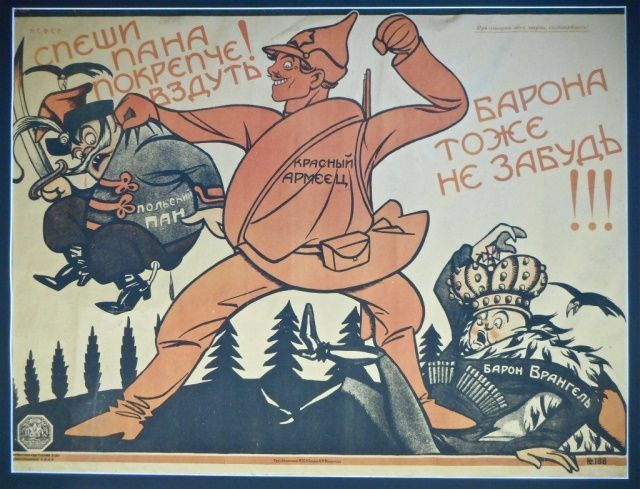 Rare pieces dating to the Russian Revolution and Civil War depict bold color graphics representative of Bolshevik anti-religious, anti-capitalist and anti-White Russian ideology by popular political cartoonists, Dmitry Moor, Viktor Deni, Alexander Apsit, and others. Following the Revolution, propagandists seized the opportunity to educate a population of largely illiterate peasants by distributing a series of colorful posters that transformed Russian Cyrillic characters into Bolshevik parables depicting life in the Soviet Union, as seen in Adolf Strakhov’s , “Alphabet Revolution”. Twenty original posters from this series will be offered for sale in this auction. Original works of art by Dmitry Moor [Dmitry Stakhievich Orlov], (1883-1946), A Russian artist largely known for his propaganda posters, and as chief artist for Bezbozhnik (http://en.wikipedia.org/wiki/Bezbozhnik_(magazine) ("Godless"), an atheistic newspaper published from 1922-1935. A collection of fine porcelain figurines manufactured by Lomonosov, Gardner, Verbilki , and Dulevo, Imperial Russian porcelain plates from the service of Tsar Nicholas II, and three Imperial Russian Porcelain Plates commissioned for the wedding of Grand Duchess Olga Alexandrovna (younger sister of Tsar Nicholas II) and Duke Peter Alexandrovich of Oldenburg, circa 1901. All items will be sold at auction, with no reserve. Interested parties may visit WWW.JJAMESAUCTIONS.COM for details. J. James Auctioneers & Appraisers is currently accepting consignments for the Spring Art and Antiques Auction, May 30, 2015, at Plymouth Memorial Hall. For a free market appraisal, please contact by email at consign@jjamesauctions.com or call 508-746-8608.